Groove-y! is an off-white milky jelly. If you ever wanted a less streaky, less beige version of Wet n Wild 2% Milk (how do I not have a swatch of that? ), Groove-y! is it. I joked on Instagram about it looking more gravy than groovy, but I do like it now that I've worn it. It could wind up being in frequent SFW rotation in the warmer months. The formula's good, as this type of shade goes. This is three coats. If you noticed the two small streaks on my ring nail, they're not Groove-y! 's fault. I'm trying out Minx Coat and wanted to see how it did under a sheer polish. 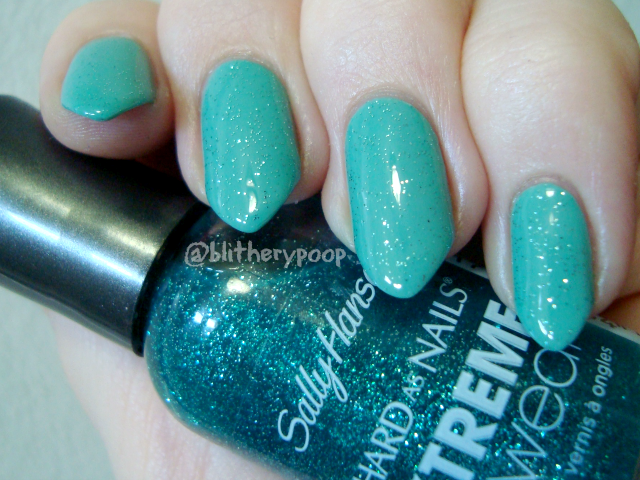 Shimmy Shimmy has teal microglitter in a slightly teal-tinted base. After last year's fiascos (and another), I was worried about trying another Xtreme Wear glitter...but I winced and bought two. Now I can joyfully report, it seems like they fixed the base issue! Shimmy Shimmy applies without any issues. The density is good too, not too much or too little. The tint of the base doesn't change the color beneath it. Shake Shake is silver microglitter in a clear base. Every bit as good as Shimmy Shimmy! There's a third microglitter, called Boogie Woogie, but it's....*sigh*....pink, so I skipped it. Get Down is a deep rose cream. When we first spotted this collection at Rite Aid, Zeus and I made faces at Get Down. It looks so frumpy in the bottle. I eventually bought it on one of those whims I get when I feel like challenging my color sense. The weird thing? I really like it! True, it matches some of my towels, but the longer I wore it, the more I liked it. The formula is thick, but not difficult to apply. It could probably be a one-coater for a lot of people, but I used two. Bottom line: All four are good! I can't even pick a favorite. The glitters apply well, which is a huge relief. If you skipped my intro babble, scroll back up and check out the CVS deal on these. It's one you don't want to miss. I loved Get Down. I wore it last month and wow. I was so surprised by it, & it looked sooo flattering. I picked up Get Down and have yet to wear it because of the same reason! I'll get there... you've given me incentive!! !